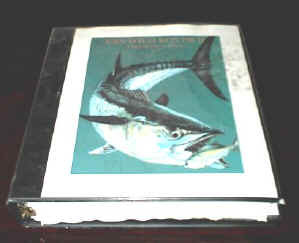 Now why on earth is there a Notebook topic on a fishing web site? I'll tell ya why.....if you are not using a notebook you WILL NOT catch as many fish year in and year out, period. BS you say. Go ask any long time off shore fisherman. I will bet you that he has notes from years and years ago. That notebook over time will contain many of the secrets that you now seek as a fisherman. It will tell you when the fish bite and where. It will give you a handy slip of paper to jot down your thoughts while you were over some killer spot. My book is on my boat every time I leave the slip to go fishing and so should yours. I prefer 3 ring binder "View binder" note books. They can be found at most major office stores. Get one that is at least 1 inch thick. While you are there get yourself a pack of 100 lb plain white paper and punch holes in it. This is heavy weight paper, like card stock and will survive much better than plain 20 lb paper. View binders have a plastic sheet over the front and rear pages so that you can slide a sheet in behind it. IF you are reading this, you have a computer. It would be my guess that you have a printer, so be creative and make yourself a nice cover for "your book". Make a piece for the binder as well so that you can put it on the shelf when not in use and still find it with no hassles. We have a book Dave, what do we put in it? Well I can't tell you what to put in yours but I can tell you what's is in mine. 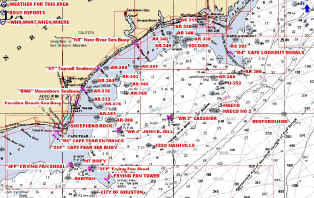 I have a list of all the local inlets and there exact GPS numbers that I pulled with my machine. I have a copy of "my" chart with numbers listed for each spot that corresponds to the locations on the next page. Keeping a detailed notebook on the boat with you every trip will help you catch more fish year after year. It is a vast information source that you will come to rely on. One last thing. Remember to take your time and do it right.